This bottle (literally) pours FUN into your glass!! 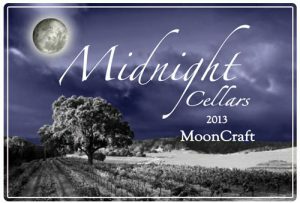 Ray and I teamed up with winemaker and owner, Rich Hartenberger, of Midnight Cellars to bring you a red blend that is big, fruity, and juicy. It is essential to mention that this wine is a complete expression of both Rich and our personalities: bold and full of spirit. Ray and I had so much fun at Midnight Cellars because Rich is, to put it bluntly, a hoot. 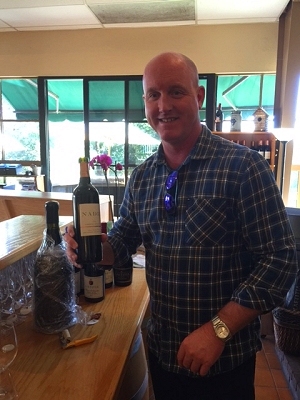 He is always smiling and embraces life to the fullest, which is clearly expressed in his wines. Midnight Cellars has arguably one of the best Zinfandels on the planet; luscious and bursting with red berries, voluptuous, and spicy on the finish which is why we wanted it to be a significant part of the blend. Ray and I also agreed that we wanted to build on the red fruit exuberance of the Zinfandel, so we incorporated Syrah in to the blend. The Syrah from Midnight offers a lot of strawberry and raspberry flavors as well as black pepper and spice. 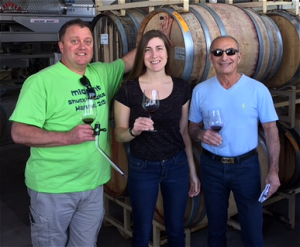 The Sangiovese (my personal favorite) was a selfish addition; when we tasted the quality of the Sangiovese in-barrel, it blew us away. We loved how the Sangiovese was drinking, lush and full of life. Rich was hesitant to let us use the Sangiovese because there was only a small amount produced; however, we begged him to let us use his prized Sangiovese and to our great pleasure, he agreed. To round off the blend, we added a touch of Merlot to give the wine structure, a depth of complexity, and softness. grilled meats, or just for everyday enjoyment. Rich is a vibrant person with a larger than life personality. It was a pleasure to work with him. We had an absolute blast making this wine. The fact that the overall quality exceeded our imagination is the icing on the cake. When you take a sip of MoonCraft, we want you to smile, relax, and have the best day ever. A note about the name: working with Rich is almost like being blasted to the moon, hence MoonCraft – the vessel of our return voyage! Crafting a clonal Pinot Noir blend with Laetitia was more like a dream come true than a business deal. I still have to pinch myself, from time to time, as a reminder that I’m not making it all up. When we met Eric, I knew immediately that we were going to get along. Eric is a cool guy, super down to earth and genuinely kind. He led us out of the tasting room and instructed Ray and I to hop in his truck and the next thing I knew, we were bouncing around through row after row of Pinot Noir vines. It was a beautiful day and quickly we forgot that just moments ago we were collecting our luggage at the Paso Robles airport. In the tasting room, there are single bottlings of each Pinot Noir Clone grown on the property. Eric was nice enough to let us try a few of these bottlings. That’s when we talked to Eric about the possibility of creating a Pinot Noir blend based off of our favorite clones. We were overjoyed and bursting with glee when Eric agreed to help us with this vision. The next thing we know, Eric is leading us to the barrel room. Ray and I walked the long aisles stacked to the ceiling with barrels, grinning from ear to ear like spoiled little children who just got their way. We pulled samples from many different barrels and discussed which clones we favored and would like to work with. In late July, based off our initial barrel preferences, Eric sent three blend samples to the store. Ray and I had already decided in California that we wanted this to be a team decision with the rest of our wine staff. I gathered the crew together at the tasting bar for the final vote on which blend to proceed with. To my great shock, it was a unanimous decision: Ray, Tom, Nick, Eric, Jon, and I all favored sample #2 which is now our coveted Draconis Pinot Noir. Ray looked at me, with a bit of the Draconis prototype still in his glass, a huge smile on his face, and with pride announced, “The quality of this wine is outstanding, if I had tasted this blind, I would have been convinced I had Robert Sinskey in the glass.” And in complete agreement, I declare that our Draconis clonal Pinot Noir blend drinks like Robert Sinskey Pinot Noir but for half the price. And if you’re wondering where the name “Draconis” came from… it is (not) a reference to Game of Thrones. Actually Laetitia and Caput Draconis are two of the Geomantic Symbols that comprise the alphabet of Geomantic Divination. 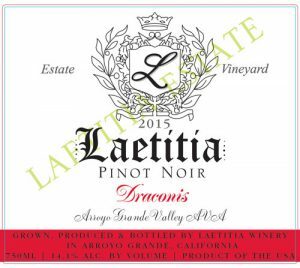 The label design used for Draconis is also used for an exclusive Whole Cluster Pinot Noir bottling that is sold exclusively in their Tasting Room. When we were at the winery, Ray and I literally fell in love with this label and were beyond thrilled when Eric allowed us to use the design for Draconis. 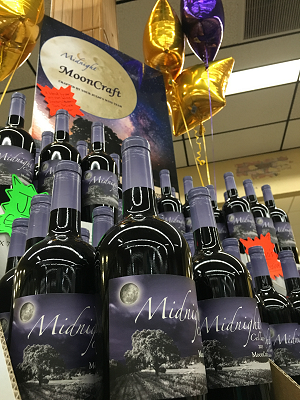 We wanted to offer our customers a red blend that is completely different than MoonCraft but equally as wonderful. Thus, Contemplations was born. This is a unique spin on a Meritage blend. Meritage is a phrase used in the United States for blends that are constructed using classic Bordeaux varietals, the red grapes being: Cabernet Sauvignon, Merlot, Cabernet Franc, Malbec, Petit Verdot. Most often, Meritage red blends are dominated by Cabernet Sauvignon and Merlot. Prior to sampling any of the barrels, Ray and I had our hearts set on crafting a blend that was heavy on Malbec as we absolutely adore the Victor Hugo Malbec. 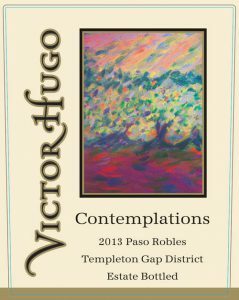 Moreover, domestic Malbec is a fairly rare anomaly and the Victor Hugo Malbec is no doubt one of the finest coming out of California. While at the winery in Paso Robles, we had the pleasure of hanging out with Vic Roberts. Vic is an honest and humble man who takes great pride and care in his craft. It was a unique contrast to our time at Midnight Cellars as Vic took a much more analytical and methodical approach to our project. We got a chance to explore the winery and taste through multiple barrel samples that Vic had collected prior to our arrival. At a picnic table outside the winery, we sat down together with our beakers and measuring tubes in hand constructing this special blend like mad scientists. Our hearts swelled with joy when we tasted the Malbec barrel sample for the first time, which confirmed our initial instincts – the Malbec was simply to die for!! After working through more barrel samples, Ray and I both agreed that adding Merlot and Cabernet Franc to the Malbec was the most compatible mix of flavors, being complex while still smooth and rustic. The name “Contemplations” was decided upon the next morning, over a cup of coffee. Ray and I were sitting at a small café in the center of downtown Paso Robles and wondering what we could possibly call this blend that would encapsulate the deep, dark, complexities of the wine while staying true to the identity of the winery. I started to search for information regarding the works from playwright and author Victor Hugo and stumbled upon a mention of his book of poetry titled “Les Contemplations”. When I suggested this idea to Ray, he grinned from ear to ear – this resonated deeply with the way we both feel about this wine – a work of deep concentration and energy from three passionate people colliding together to one definitive goal. I hope with each sip, you too, contemplate all that is good and delicious in your world. A tribute to history, health, and happiness! The Cuvee 1717 is a commemorative wine to honor the city of Westborough, as well as the people who live in this town, work in this town, and for all Massachusetts residents whom are a part of the history and culture that make our state truly special. The Cuvee 1717 is named after the year that the town of Westborough was incorporated and serves to thrill, tantalize, and excite our customers as together we embark on the 300th birthday of this charming town! We are SO grateful and lucky to partner with Terry Theise, a local wine importer, whom has built a name in the industry as a champion of Grower Champagne and thus has graced New England with an expansive Champagne portfolio. 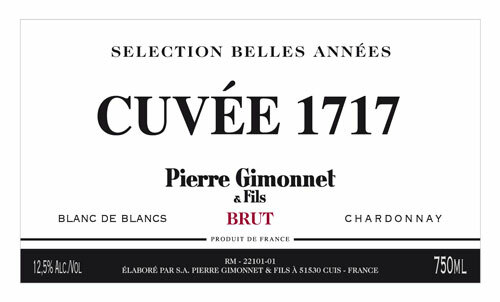 He generously secured what was available of the Pierre Gimonnet Selection Belle Annes, rated 94 points by Wine Enthusiast, for Julio’s to use exclusively. Terry has also agreed to host a Grower Champagne Seminar and Tasting on November 17th from 7-8:30pm. We invite our customers to join us in this free event as we will not only be pouring the Cuvee 1717 but many other Champagnes from Terry’s Portfolio. Most importantly, we hope that in the upcoming holiday months, when you decide to reach for a bottle of Champagne – whether it be to kick off a holiday, ring in the New Year, celebrate your own anniversary, birthday, fiesta… or simply just to kick back and enjoy a glass of bubbles – that you select the Cuvee 1717 and think about how amazing IT all is.